Origin and Habitat: Central America: the natural range occurs on the Atlantic slope from Honduras to Costa Rica, but the species is now introduced into most of Central America and elsewhere. Inhabits lakes, springs and ponds, preferring turbid waters with a mud or sand substrate; often found in warm oxygen-depleted lakes. Compatibility/Temperament: Territorial, aggressive when breeding even to females, predatory. Maintain alone, or a pair in a very large aquarium. Naturally feeds on smaller fishes and invertebrates. In the aquarium feed earthworms, crickets, shrimp, insects. In the aquarium 12 inches is standard, but this fish can attain 22 inches (55 cm). Medium hard to hard (10-18 dGH), basic (pH 7 to 8.7), temperature 25-36C/77-97F but optimum 25-28C/76-82F. 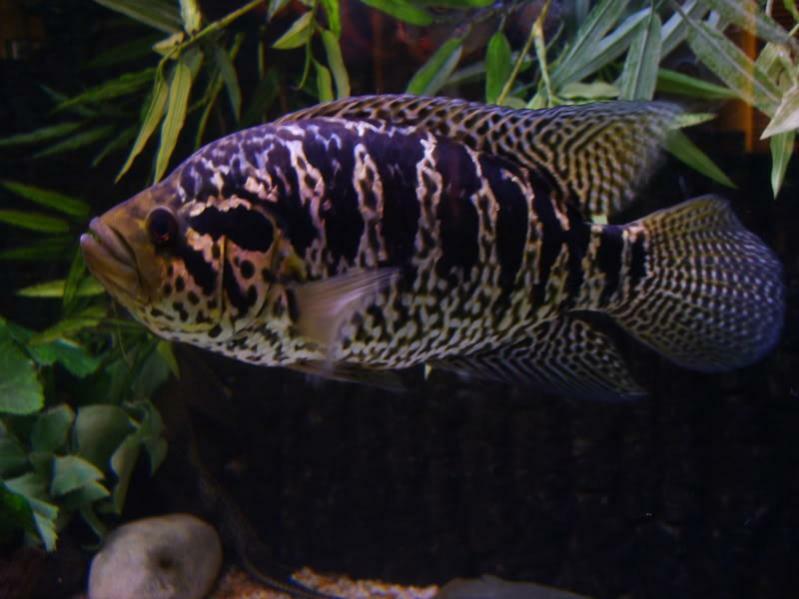 A very aggressive and predatory cichlid that needs a very large tank. A fine gravel or sand substrate, with smooth river rocks and bogwood and good filtration. If a female is included, provide plenty of good hiding places for her, as the male will be very aggressive if the female is not ready to spawn. A 6-foot tank is minimum for a pair. The male has elongated dorsal and ventral fins; females are smaller with more red on the gill covers, especially during spawning. Substrate spawner. A spawn can include 1000 to 2000 eggs, and some sources mention 3000. Raising the fry will require considerable space, and this species should not be bred unless this can be provided. This is a food fish for humans in its habitat region. This species was described in 1867 by A. Gunther and named Heros managuensis. The species epithet refers to the Nicaraguan capital city of Managua. For a time the species was moved into the genus Cichlasoma, and briefly (by Burgess) Nandopsis. Kullander (2003) established it in Parachromis, a genus originally erected by L. Agassiz in 1859. The genus name is derived from the Greek para [= side] and chromis [probably a perch fish]. Kullander (1998) established the subfamily Cichlasomatinae for several genera of the Neotropical cichlids. Kullander, Sven O. (1998), "A phylogeny and classification of the South American Cichlidae (Teleostei: Perciformes)," in L.R. Malabarba, R.E. Reis, R.P. Vari, Z.M. Lucena and C.A.S. Lucena (eds.) "Phylogeny and classification of neotropical fishes," pp. 461-498.